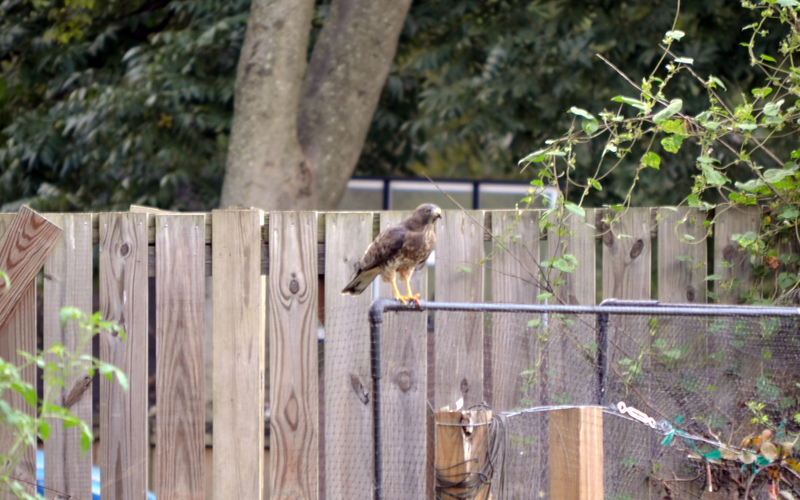 While listening to a football game on the sun porch, something unusual caught my eye on the back of the garden. A peek through some cheap binoculars I had handy confirmed what I thought I was watching, so I grabbed my camera and a 200mm zoom lens and stalked out onto the patio to see if I could get a picture. One of our local Red Tailed Hawks had snatched up a small snake and was consuming it while perched on the blackberry netting frame. He (or she?) tolerated me observing from 100 feet away and made quick work of the little “snack”. And with that it took one more glance around then moved on. I saw it again this evening moving about; I’m hoping it has discovered that my wildlife-friendly garden offers some very healthy tomato-fed squirrels and will become a regular visitor. When you learn to train the wildlife to snack on what you want you’ll make a fortune on your lecture tour. I will be your first cult member! I’ve seen him in the general area 3 days in a row now, so maybe he’s catching on…. Truth is I was sorry to see the snake get snatched. But the wildlife water and cover I have created has the back crawling with all sorts of good little reptiles and amphibians these days. YES!!! A squirrel eating hawk would be just the ticket around here! Let me know if it works! When the trees are bare in the winter, the hawks actually do a number on the squirrels, which is good because otherwise all the pecan trees around here would support an army of spring and summer garden raiding rodents for the whole winter. I’ll see one sitting high up in the branches as dusk approaches, waiting without moving until one of the tree rats tries to make it across the open area. 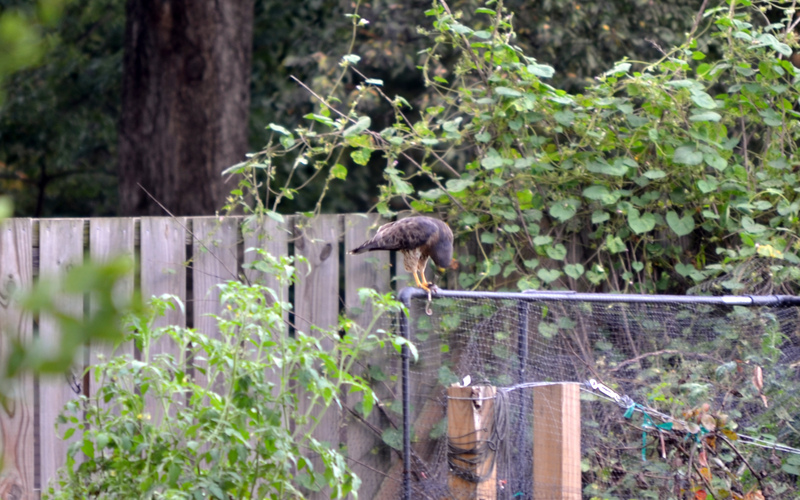 Usually they run across on top of the back fence looking out for cats and the guard poodle below…. so they never see it coming. We were sitting on our patio a few weeks ago and one of these find feathered friends came swooping down and stole two baby birds out of the mother’s nest. We had been watching these little babies for several days and were very unhappy about that.